Villa d’Este Italy–When Rolls-Royce presented the 103EX Vision Vehicle to the world, it invoked its coachbuilding heritage to inspire its future clientele. This Vision Vehicle envisaged a world of completely personal luxury mobility where new technologies would allow every Rolls-Royce to be designed in their owners’ image, should they wish. Such a Rolls-Royce would represent the truest meaning of luxury – a personal, Bespoke motor car like no other for each individual commissioning patron. The idea of a future coachbuilt Rolls-Royce was not enough for one Rolls-Royce connoisseur however. This individual approached the marque with his own idea of a two-seat Rolls-Royce that he wanted to be created in the here and now. That motor car is here, now, and is christened ‘ Sweptail’. In a nod to the swept-tail of certain Rolls-Royces from the 1920s, admired by the client so much, he asked Rolls-Royce to reimagine this feature on his one-off motor car. “Sweptail is the automotive equivalent of Haute Couture,” comments Giles Taylor, Director of Design at Rolls-Royce Motor Cars. “It is a Rolls-Royce designed and hand-tailored to fit a specific customer. This customer came to the House of Rolls-Royce with an idea, shared in the creative process where we advised him on his cloth, and then we tailored that cloth to him. You might say we cut the cloth for the suit of clothes that he will be judged by. ”Inspired by the beautiful coachbuilt Rolls-Royces of the 1920s and 1930s, the customer’s desire was for a coachbuilt two seater coupé featuring a large panoramic glass roof. As a connoisseur of Rolls-Royces, he was inspired by many of his favourite cars from the early 20th Century, as well as many classic and modern yachts. 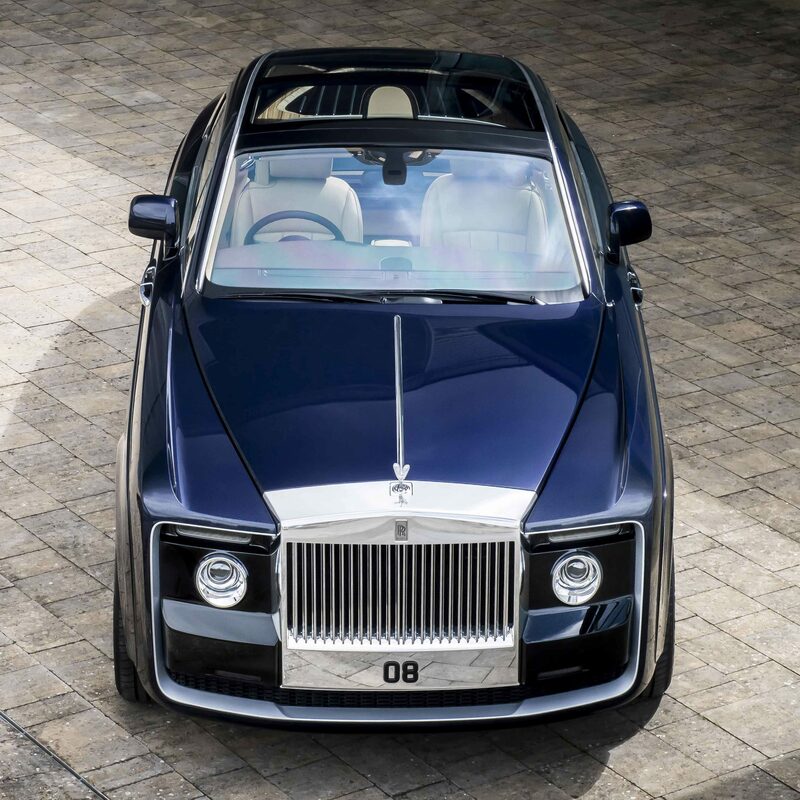 The ‘Sweptail’ is without question a Rolls-Royce that fits to the marque’s DNA. One’ s attention is first attracted by the confident and solid character of the front profile, centred on a new treatment of the iconic Rolls-Royce Pantheon grille. The largest of any modern era Rolls-Royce, the grille is milled from solid aluminium before being painstakingly polished by hand to a mirror finish. The periphery of the front face of ‘ Sweptail’ is framed in brushed aluminium. Generous quantities of polished Macassar Ebony and open-pore Paldao adorn the interior, creating visual and tactilecontrasts for the owner, both classical and contemporary. It is set off by contrasting light Moccasin and Dark Spice leathers that adorn the seats, armrests and dashboard top. A most personal, coachbuilt Rolls-Royce for a specific customer, every aspect of the material treatment of ‘Sweptail’ exudes handcrafted quality and exacting attention to detail. In short, it is a Rolls-Royce but like no other before. BALTIMORE, Nov. 13, 2015 /PRNewswire/ — Employees at Bacardi Bottling Corporation, part of the Bacardi group of companies, received international recognition for their contributions to wildlife habitat conservation and education at the Wildlife Habitat Council (WHC) Conservation Conference in Baltimore, Maryland, on November 12. Bacardi once again demonstrated its commitment to environmental stewardship by achieving Wildlife at Work recertification. Bacardi Bottling Corp.’s Eric Hearn, Environmental Health Safety Coordinator, and Sally Cannon, processing/training coordinator and wildlife team leader, were presented the certification at the annual event. Bacardi Bottling Corporation, located on 92 acres in Jacksonville, Fla., is the sole bottling plant for BACARDI® rum branded products enjoyed in the United States. The facility is surrounded by rural residential areas and includes on-site habitats such as wetlands, forest, and grasslands. The team at Bacardi Bottling Corporation actively manages 21 of the site’s acres of wildlife habitat as part of a Wildlife at Work program that has been certified through the Wildlife Habitat Council since 2013. The program to develop and preserve wildlife on campus is part of the Bacardi group of companies overall “Good Spirited: Building a Sustainable Future” corporate responsibility platform to protect native habitats, control invasive species, water conservation, and other preservation efforts. For their first step in managing wildlife, the all-volunteer employee team at Bacardi began converting the site’s grassy fields into native warm-season grasses and wildflowers. 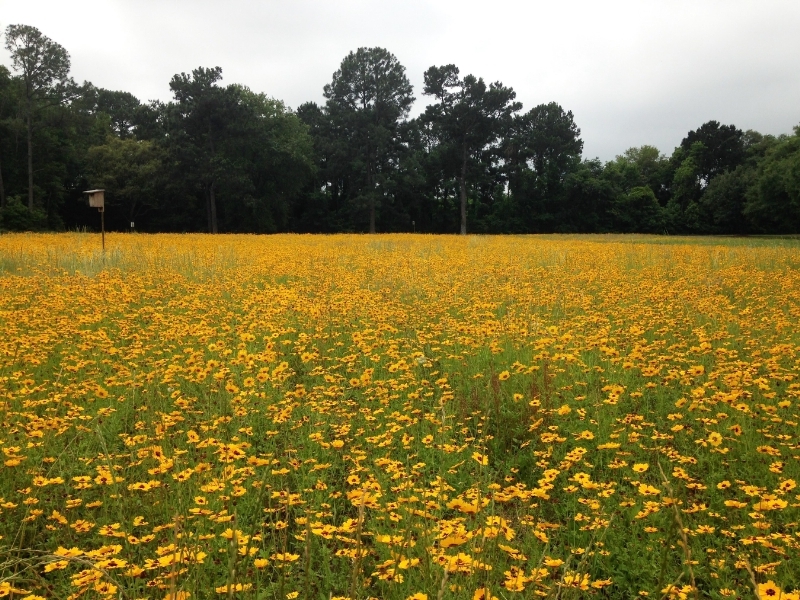 Five acres were initially seeded in 2012 with wildflowers, and later with native warm-season grasses in 2013. Phase II of the project began in late 2014 with an application of herbicide before native species were planted using a seed drill across 20 acres. Strictly native species were used in both areas, including blanket flower, black-eyed Susan, slender Indian grass, and big bluestem. Monitoring is conducted using photographs over time as well as 3×3 sample plots that are surveyed for species. The new grasslands are maintained through occasional mowing, and the team plans to plant both areas with native milkweed in 2015. Most recently, the Bacardi team erected eight songbird nest boxes targeting the native eastern bluebird. In 2014, local Cub Scouts joined the team to construct the boxes. These nest boxes—which include names such as ‘Home Tweet Home,’ ‘House of Blues,’ and ‘The ReTweet’—were named by employees via a competition. The team installed the nest boxes based on advice from a local bird expert and have since been visited by Florida Audubon Society members. The team monitors the boxes weekly during the nesting season and is excited about their first full nesting season. Bacardi Bottling Corporation was one of 273 programs recognized at the WHC Conservation Conference as meeting the strict requirements of Wildlife at Work certification. In addition, 59 programs received Corporate Lands for Learning certification. Certification requirements are strict and require that programs apply for periodic renewal. Wildlife at Work certification recognizes outstanding wildlife habitat management efforts at corporate sites and offers third-party validation of the benefits of such programs. Corporate Lands for Learning certification provides programs with third-party recognition for educational programs. Founded in 1972, Bacardi Bottling Corporation is a Center of Excellence for Bottling and the sole bottling plant for BACARDI® rum branded products enjoyed in the United States. The facility also provides BACARDI® rum for export to Mexico, Canada, Bahamas, Puerto Rico, Germany, South Korea, Costa Rica, South America, Israel, New Zealand, Australia and Japan. The facility employs more than 200 people and is situated on a 92-acre campus. WILSONVILLE, Ore. (November 12, 2015) – World of Speed, an educational and interactive motorsports museum, announces a new exhibit featuring female motorsport legends. The Women in Racing exhibit will be unveil on Saturday, November 21. What: The Women in Racing exhibit will showcase the rise and triumph of women in motorsports and highlight how women’s participation in motorsports has grown over the decades, both on and off the track. The exhibit will feature Cindi Lux, Lyn St. James, Courtney Force, Betty Burkland and Michelle Miller. Each racer will be portrayed through personal memorabilia and pictures, a video incorporating excerpts from the women, and the story of women rising in professional motorsports. Cindi Lux: Cindi is a 12-time road racing champion who lives in Aloha, Ore. where she runs her company Lux Performance. Her Viper will be also be on display. Lyn St. James: Lyn has raced the Indy 500 seven times and set 31 national and international speed records. Courtney Force: Courtney holds the record for most funny car wins by a woman. She was the 100th win by a female driver in an NHRA competition. Betty Burkland: Betty holds the land speed record for E/BFCC (blown fuel competition coupe) class at 263.887 mph. She is part of the Bonneville 200 mph Club. Michelle Miller: Michelle is a two-time winner of the SCCA National Autocross Championship. She is also an instructor at DirtFish Rally School in Snoqualmie, Wash. The World of Speed is an educational museum featuring historic racecars, boats and motorcycles that tell the story of motorsports culture. Through interactive exhibits and hands-­on activities, the World of Speed offers visitors a behind-­the-­scenes view of the racing world. It encompasses many aspects of motorsports, including drag racing, road racing, land speed racing, motorcycle racing, open wheel, NASCAR and hydroplanes. The museum is funded by income from sponsorships, foundations, admissions, corporate and individual memberships, and from events held at the museum. World of Speed is a 501(C)(3) public charity. For more information, please visit http://www.worldofspeed.org. WELLESLEY, Mass., Nov. 12, 2015 /PRNewswire-USNewswire/ — Two esteemed culinary leaders will be inducted into the Academy of Distinguished Entrepreneurs at Babson College on November 12, 2015. Dorothy Cann Hamilton, Founder and CEO of the International Culinary Center (ICC), and creator and host of Chef’s Story, and Doug Rauch, Past President of Trader Joes, Founder of Daily Table, and CEO of Conscious Capitalism Inc., will be honored for their entrepreneurial influence and accomplishments across the food industry. Established in 1978, the Academy of Distinguished Entrepreneurs is the world’s first entrepreneurship hall of fame. It includes more than 100 notable business figures such as Robert Kraft H’02, Founder, Chairman, and Chief Executive Officer of the Kraft Group, Ray A. Kroc, former CEO of McDonalds, Richard Branson, Chairman of the Virgin Group, and Steve Forbes, President and Chief Executive Officer of Forbes. Babson College is the educator, convener, and thought leader for Entrepreneurship of All Kinds ®. The top-ranked college for entrepreneurship education, Babson is a dynamic living and learning laboratory where students, faculty, and staff work together to address the real-world problems of business and society. We prepare the entrepreneurial leaders our world needs most: those with strong functional knowledge and the skills and vision to navigate change, accommodate ambiguity, surmount complexity, and motivate teams in a common purpose to make a difference in the world, and have an impact on organizations of all sizes and types. As we have for nearly a half-century, Babson continues to advance Entrepreneurial Thought and Action ® as the most positive force on the planet for generating sustainable economic and social value.